After the Armistice back on my plant farm in Connecticut, I decided to work on my new types of Delphinium and growing the tall garden hybrids on a small scale purely for the fun of growing them and the joy of having them around. In 1934 I made a few interesting inter-species crosses, first using carefully selected plants of belladonna/tatsuenense referred to previously in connection with the exhibition at the Museum of Modern Art. The Cashmerianum itself and Elatum plus Cashmerianum entered the project and low-growing unidentifiable Rocky Mountain species was added. More important, I had also after many, many attempts produced two seedlings from crosses between the garden hybrids and the belladonna tatsuense crosses. Theses two seedlings were intermediate between the belladonna/tatsuenense and the garden hybrids, taller and more lusty than the belladonna/tatsuenense. They both had double elatum-type flowers like the tall parent, but they were completely sterile. About that time scientists discovered that the drug, Colchicine, which, incidentally had for a number of years had been playing an important role in the treatment of several vicious attacks I had of gout, could double the chromosomes count in plants and turn diploids into tetraploids. Plants which were sterile because they had inherited only one set of chromosomes could be rendered fertile with this drug by doubling the chromosomes. After inquiry and study I tried this on the sterile elatum/belladonna/tatsuenense seedlings. With beginner’s luck, three nice fat seed pods produced viable seed. These seedlings represented the almost miraculous beginning of a new race of what might be called a ‚bush’ Delphinium, with florets from two to three and a half inches in diameter. Among the several dozen seedlings resulting from the Colchine treatment there was one with large single flower. As I felt the single flowers were more suitable for this bush type than the double flower I discarded the doubles and concentrated on the inter-species crosses I have previously listed, also crossing in selected Cheilanthum seedlings. 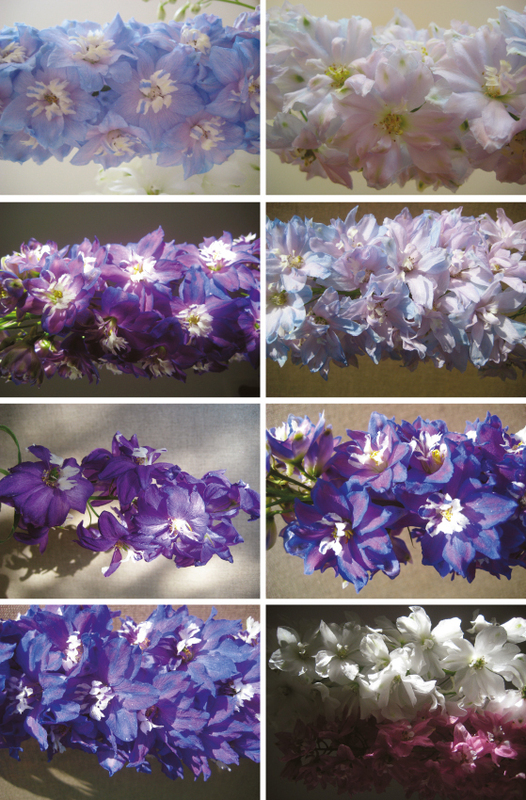 As this complexly evolved new race of Delphiniums oribinated and was developed here in Connecticut, I am consequently referring to them as Connecticut Yankees and the work is far enough along now insofar that they exist in the full range of Delphinium colors. They will be ready within the next year or so to be turned over to one of our large scale seed-producing firms and, like our Mark Twain’s Connecticut Yankees, they are sure to turn up sooner or later in the land of King Arthur’s Court. Lost and found: In 2013 we did some research concerning the conceptual art of hybridizing for the exhibition "(Landscape) with Flowers". One of the most prominent artist-plantsmen we found was the world famous photographer Edward Steichen. From 1908 until his death in 1973 he bred delphiniums, and he drew clear parallels between his approach to photography and to plant breeding. From this exhibition Steichen hoped to gain recognition for breeding plants as an art form—but was disappointed. Steichen’s demands of the art business remain without much consequence to this day. For him, flowers were central objects of aesthetic work, which involve questions of form every bit as much as their intensive preoccupation with light and color. He pursued plant breeding as an art form equal of photography, painting or literature, and he remains to be discovered as pioneer of BioArt. In 1965 Steichen presented an entirely new variety of smaller delphinium—“a bush covered by blue butterflies.” He called this delphinium 'Connecticut Yankee', after Mark Twain’s novel A Connecticut Yankee in King Arthur’s Court, and, released them with the wish "like our Mark Twain’s Connecticut Yankees, they are sure to turn up sooner or later in the land of King Arthur’s Court." Today, it is the only one of his breeds that is still available. While Steichen’s photographic works can be traded at high prices on the art market, today his 'Connecticut Yankee' variety can be had for around 2 dollars in a garden center—though without any mention of the artist. We managed to get some seeds and to grow some beautiful plants that were presented in the exhibition. The photo shows the varity of colors, coming out of one package of seeds. Unfortunately now they are all gone.